Using power analysis attacks, including Simple Power Analysis, hackers can attack the embedded microchips inside smart cards. The 2008 Security 7 Award winners have their say on information sharing, perimeter security, relationships, convergence, strategy, history and progress. Application Security Inc.'s AppDetectivePro does deep inspections of database configurations to identify security issues. It's ideal for internal and external auditors, security professionals, consultants and others who need to perform on-the-fly database vulnerability assessments. Finjan's Finjan Vital Security NG-5000's Web filtering engines provide strong detection of Web-based security threats. Figure out the right questions to ask your network access control (NAC) service provider or vendor. LogRhythm is a cross-platform log management that manages audit files and IT security management processes. Unravel the ins and outs of how your organization should deploy encryption. Cymphonix's Network Composer is a security and visibility appliance that controls and monitorstraffic passing through the network perimeter to the Internet. Experts Bruce Schneier and Marcus Ranum debate whether risk management is an appropriate strategic direction for information security professionals to follow. Dale Carnegie's "How to Win Friends and Influence People" can be a valuable tool for CISOs who are up against social engineering issues. Chris Nickerson of Lares Consulting explains best practices for penetration tests and the risks of outsourcing. 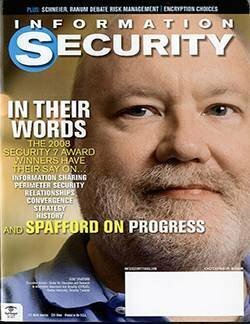 Information Security magazine's Security 7 Award winners write personal essays on topics ranging from perimeter security, information sharing, physical and logical security convergence and progress made in the industry.